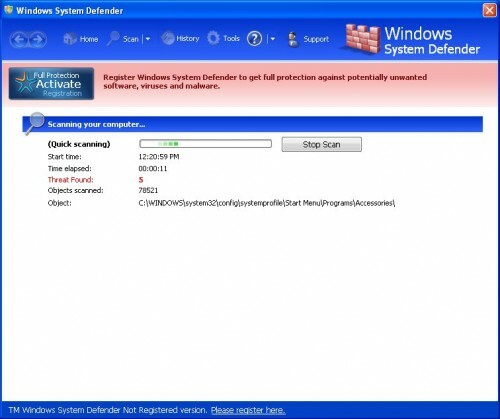 Windows System Defender is a new rogue antispyware program from VirusDoctor family as Windows Enterprise Defender. It is distributed through the use of trojans. Just like most fake antispyware Windows System Defender will display fake system alerts or fake security alerts informing the user that their computer is infected. This tactic is to trick the user into purchasing the full licensed version. During installation, Windows System Defender configures itself to run automatically every time, when you start your computer. In addition the program creates some files with random names which later during the scan will determine as trojans and spyware. It then scans your computer for supposed spyware and malware and displays a list of the items found. All of these infections are fake, so you can safely ignore them. While Windows Enterprise Defender is running you will also see numerous security notifications appear from your Windows task bar. It will state that your computer is infected or is under attack by an Internet virus. You should ignore all the warnings that the rogue gives you and remove it from your computer. Use these free instructions below to remove Windows System Defender and any associated malware from your computer. Select Perform Quick Scan, then click Scan, it will start scanning your computer for Windows System Defender Defender infection. This procedure can take some time, so please be patient. Make sure that everything is checked, and click Remove Selected for start Windows System Defender removal process. When disinfection is completed, a log will open in Notepad and you may be prompted to Restart.